For any business, creating a user-friendly website is a good place to start. This is where themes, templates, and forms play a vital role to compel your prospects for conversions. Ready to kickstart your website? Buy Now! Responsive and multi-purpose site template which is suitable for the portfolio or creative websites. It's an HTML/CSS template with rich styling elements and unique features. Useful documentation files also included for easy installation. Fully responsive minimalist one-page template. It features a clean and fresh design and is intended for websites with concise content. Elegant minimal bootstrap e-commerce template with animated bootstrap carousel, navigation plugin with on hover drop-down menu, great use of typography and much more. Flexxar is a super flexible responsive html5 template with a modest design touch. it's designed to be flexible enough to fit any site type or needs. 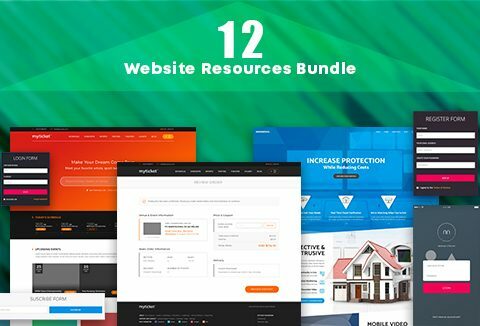 It comes with 4 predefined color schemes, 5 different banner backgrounds with a subtle parallax effect, 15 template pages, flex slider slideshows & carousel, mega menu and more. Flat colorful metro style website template design with lots of features. Flat, responsive and multi-purpose set of templates that have been created specifically for freelancers, agencies, companies or new app startups looking for a fresh, modern, and flat design. Ina is a photo WordPress theme suitable for travel, lifestyle bloggers and for those who want to tell stories with ease. It can be used as well as a portfolio to showcase your latest works. It comes with a modern and elegant design, fast loading and simple to use. Adeline is a beautiful responsive WordPress blog theme with a feminine touch. It has a minimal and lovely design and comes with stunning features such as – multiple homepage layouts, featured sliders, portfolio pages, gallery pages, Instagram photos. It is perfectly suitable for travel, lifestyle, photography, food blogs. All-in-one authentication web forms designed in various styles for your mix & match. Based on latest bootstrap includes login/signup forms, registration/password recovery forms, 350+ icons, wizard step form. Delivered as an instant download once you place an order. You cannot resell and redistribute them as it is. Ready to create your own beautiful, top-quality, easy to navigate website?